What’s better than one mermaid cut file? Two mermaid cut files! I’ve got two fabulous and free mermaid SVG cut files that you can download and use to make quick and easy craft projects. It’s time for another round of Craft Lightning and this round’s theme is obscure holidays. You know – all those fun holidays we celebrate like National Coffee Day and National Mac and Cheese Day. There are so many awesome days to celebrate throughout the year and I thought it would be fun to celebrate National Mermaid Day with two free Mermaid SVG Cut Files. And, since it’s Craft Lightning, that means we’re making craft projects that take 15 minutes to make. First, I made this fun makeup bag. 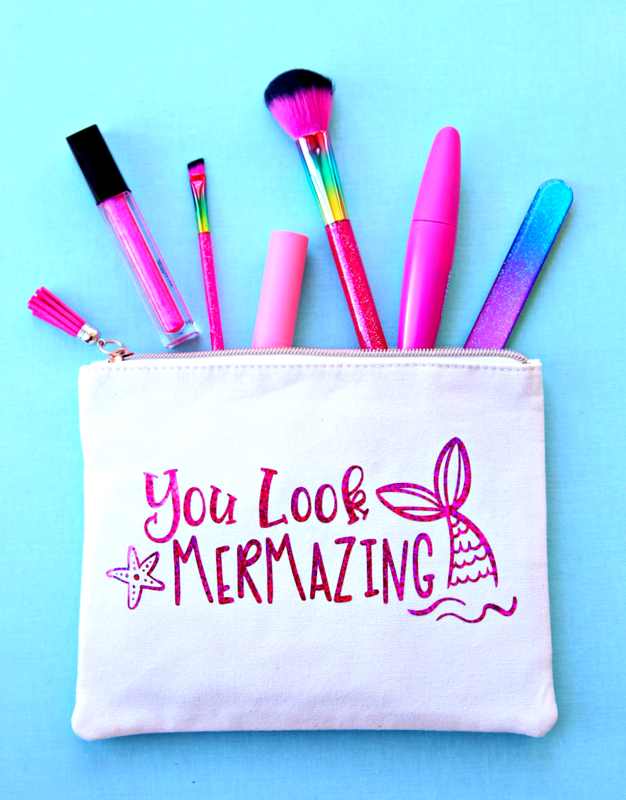 Every mermaid needs a glittery makeup bag for all their makeup. Download the cut file and upload into design space. Size it to fit your makeup bag. Add vinyl to cutting mat. Cut design using your handy dandy Cricut. Make sure to mirror the image before cutting. Weed excess vinyl from around the design and adhere to the makeup bag using the EasyPress or iron. And, then I made this adorable mug . 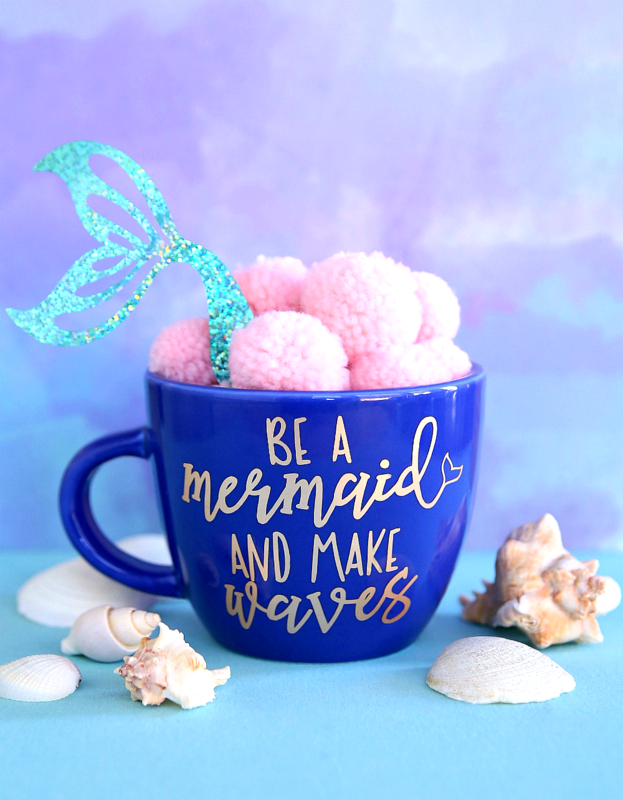 Every mermaid needs an inspiration mug and a reminder to be a mermaid and make wave. I love the gold vinyl on the bright blue mug. Download the cut file and upload into design space. Size it to fit your mug. Cut design using your handy dandy Cricut. Weed excess vinyl from around the design. Add a piece of transfer tape over design and remove image from paper baking. Adhere the image to the mug. 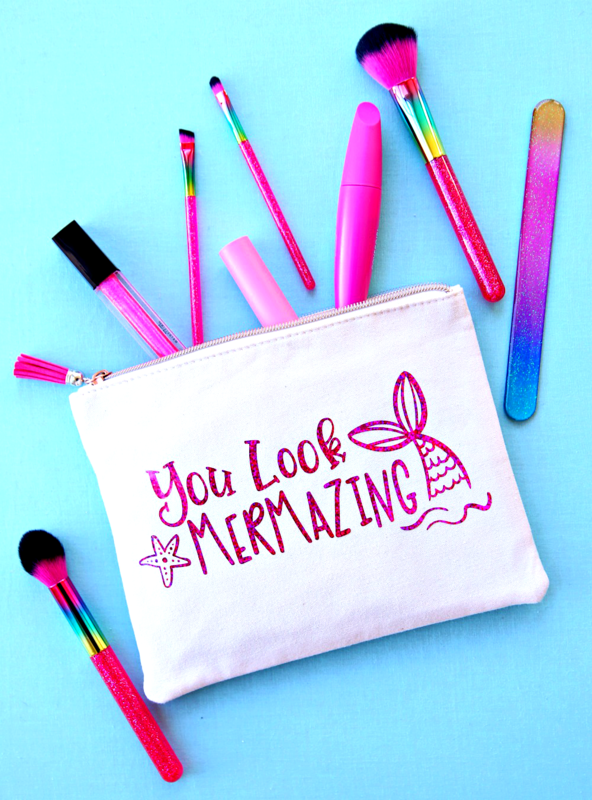 Do you love mermaids? Have a friend who loves mermaids? Then, you need to make both of these fun craft projects for yourself and all your favorite mermaids. Want more Free SVG Cut Files? 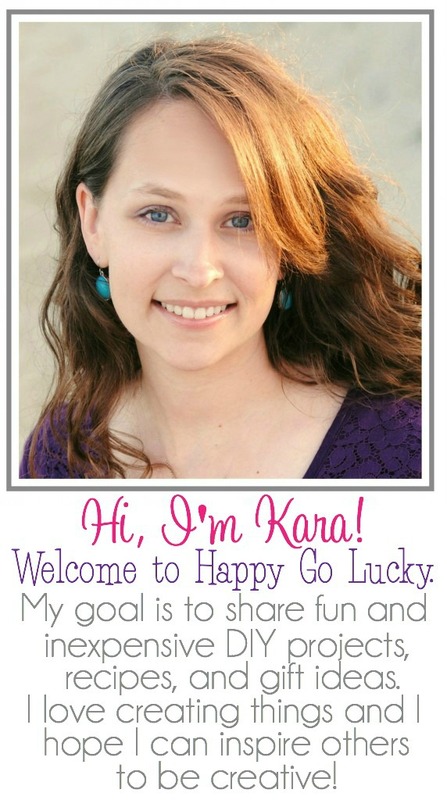 Check out my collection HERE.